You know him as eLDee the don, now see him in a different light as the rapper covers the latest issue of Motherhood In-Style magazine alongside his wife and daughter. 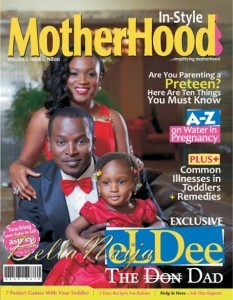 The fab family paint an endearing cover picture and Mr and Mrs Dabiri discuss parenthood and how they manage to juggle work and life. There are also features on parenting a difficult preteen and a list of common ailments that affect toddlers, with their remedies. Motherhood In-Style is now available in stores. My name is ellianna i saw your profile today and became interested in you,i will also like to know you more,and if you can send an email to my email address,i will give you my pictures here is my email address ([email protected]) I believe we can move from here! Awaiting for your mail to my email address above. Please email me on ([email protected]) for more communications.